Last July 20, one blogger emailed me about a campaign which is to dedicate and share a blog on a certain disease – Mesothelioma Cancer. This is the first time I heard of it, though I know there are many kinds of the devastating cancer. What surprised me more is that the sender is a survivor! She beat the odds 8 years ago but had her left lung removed. She overcame the trial and do the mission of her second life – to educate everyone about Mesothelioma Cancer and help save lives. to post here for the sake of the awareness campaign. As a part of this campaign, here I am posting a blog. It took me almost a month before finally posting as I went over blogs about the Mesothelioma Cancer patients and survivors. I was teary-eyed reading especially when the latest post was not written by the blogger/patient anymore as he/she was fetched by heavens above. And there’s also a blog of a Mesothelioma Cancer warrior posting farewell to a fellow patient who just passed. Let’s take a moment to pray for their continued fight while being aware of what Mesothelioma Cancer is and stop the increasing number of people diagnosed which is almost 3000 each year. Mesothelioma Cancer is a form of cancer which develops in the thin protective membrane of the internal organs due to exposure of asbestos. Asbestos is mostly used by manufacturers and builders because of its suitable physical properties: sound absorption, tensile strength, resistant from fire, heat, electrical and chemical damage, and reasonable cost. Asbestos is the major factor of cancer in the US for more than 30 years. Not only US can be affected by Mesothelioma Cancer but also to places that has asbestos materials such as old homes, schools, factories and any commercial buildings. Even second-hand asbestos recipients are at risk just by touching items that were exposed to asbestos beforehand or have asbestos fibers on them. Men are at higher risk of Mesothelioma Cancer than women. However, women and children can become victims too through secondhand asbestos exposure. No amount of asbestos exposure is safe for the body, especially the respiratory system. Mesothelioma Cancer is not easy to be detected as the symptoms are very similar to other respiratory ailments – chest pain, chronic cough, discharges of the chest and abdomen, weight loss, bowel obstruction, fatigue, anemia and the presence of blood in lung fluid. Also, it is difficult to diagnose as it will only appear 30 to 60 years after the initial exposure to asbestos. People diagnosed with Mesothelioma Cancer are just given 10 – 15 months to live. Suspected Mesothelioma Cancer patient can be confirmed through screening exams such as chest X-ray, CT scan, MRI, cytology, biopsy, and thoracoscopy which inserts a tube with built-in camera into the chest. 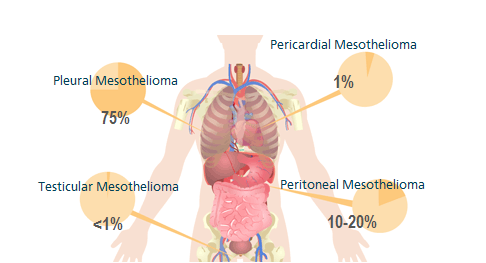 There are 3 types of Mesothelioma Cancer based on the part being affected. Pleural Mesothelioma, the most common type, targets the outer lining of the lungs and internal chest cavity. Peritoneal Mesothelioma affects the lining of the abdominal cavity. And Pericardial Mesothelioma, the most challenging type, impacts the sac around the heart. Another type which is rare is the Testicular Mesothelioma and affects the sac around the testis. There is no known cure for Mesothelioma Cancer but treatment options are available. There are chemotherapy, radiation therapy, surgery and pleurodesis which bring in talc substance to reduce the pleural space. This may sounds a cliché, but prevention is better than cure! To avoid from getting Mesothelioma Cancer through first and secondhand asbestos exposure, proper cleaning facilities should be available on site so men working with asbestos in the area cannot bring them home though their body or clothing. Just by simply covering your nose with wet naps when you pass through the area or taking a bath after will help as well. This campaign allows me to learn many lessons. Ignorance is not an excuse. Whether aware or not, everybody can acquire this if prevention is taken for granted. Life is so short to spend so spend the best days of it! If you’re into this situation of having Mesothelioma Cancer, do not lose hope. You are not the only one who’s carrying the burden. Like this, you can reach out to blogs and social media and find friendship with the other warriors. You can learn how to surpass the challenge through each other’s experiences. Inspire others of your courageous journey in fighting Mesothelioma Cancer and raise more awareness than ever! I hope this post will help in some way.